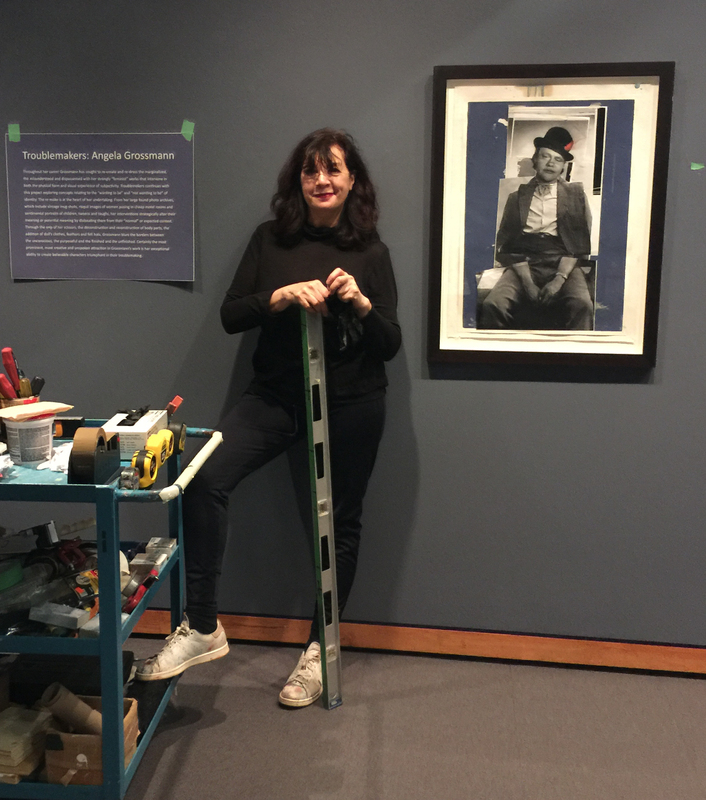 Artist Angela Grossmann preparing her exhibition “Troublemakers” at McMaster Museum of Art, McMaster University. Exhibition opens January 17 at 6 pm. Talk Jan 18 at 12:30 pm. Angela Grossmann’s works address the role that performance plays in the transgression of gender and social expectation, the stigma of the unruly body and the disciplinary power of shame. The exhibition Angela Grossmann: Troublemakers opens at the McMaster Museum of Art with a Public Reception January 17, 6-8 pm and is on view until March 9, 2019. Angela Grossmann is a Vancouver-based visual artist. Over the last two decades her paintings and collages have been the subject of more than 20 solo shows in Canada, the U.S. Europe and Japan beginning with the Young Romantics Exhibition at the Vancouver Art Gallery (1985). The Art Newspaper (June 2006) included Grossmann on a list of 100 artists who have most influenced students at art schools in Britain (culled from 11 leading British art schools). Recently her work has been featured in three Vancouver Art Gallery exhibitions including Unreal that showcased her miniature surrealist paintings. A series of her collages were featured in a solo booth at ArtToronto 2015. Grossmann’s work has been the subject of numerous scholarly articles including: Princeton Press: The End of Innocence: Picturing Her (Dr. Loren Lerner), Le Mois de la Photo: Memoires and Testimonies (Dr. Martha Langford), Hobo Magazine: Alpha Girls (Sean Starke): Flesh for a Fantasy ( Danielle Egan), Canadian Art Magazine: Portrait a Toughs (Deborah Campbell), Canadian Art, Whitehot Magazine, the Vancouver Sun, the Georgia Straight and Border Crossings reviewed Grossmann’s Models of Resistance. Alongside her solo career Grossmann continues collaborations with the Futura Bold collective, its members including: Attila Richard Lukacs, Graham Gillmore and Douglas Coupland – to date the group have launched six major self-initiated projects. An illustrated exhibition brochure with essay by Dr. Lynn Ruscheinsky is available at the Museum.